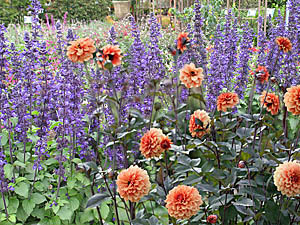 The smashing perennial combination of dark blue and apricot makes a dynamic statement in a sunny border from early summer to fall. Sage ‘Mystic Spires’ begins blooming in late spring and continues until frost. It might need cutting in mid season to rejuvenate it but it will then bloom into fall. Dahlia ‘David Howard’ first adds purple foliage to the scene followed by luscious flowers in early summer that continue to bloom into fall without deadheading. 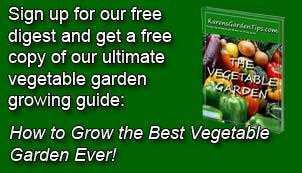 Grow in full sun, and medium moist, well-drained soil. Sage (Salvia) ‘Mystic Spires’ Sage ‘Mystic Spires’ is a compact form of Sage (Salvia) ‘Indigo Spires’ but is shorter, more free flowering, and better behaved. If is lower stature does not meet your needs considers trying the larger cultivar. The purple-blue flowers are borne in spikes and attract bees and butterflies; the leaves are dark grey-green. Plants are tolerant of heat and humidity. Dahlia ‘David Howard’ The handsome dark bronze foliage of dahlia ‘David Howard’ makes a beautiful backdrop for the plants apricot flowers. Each flower is two to four inches across and is fully double with broad, flat petals. Pinching early buds creates bushier plants but staking is necessary. Afternoon shade may be necessary in the South. Lift tubers in cold climates and store for the winter.